Many staff and students at the University of Sussex are using Padlet, which is a very versatile and flexible digital tool that we have been sharing with colleagues for a few years. At the beginning of April 2018, Padlet changed its pricing model, so if you have been using the free version (now called Padlet Basic) there are some new limits on what you can do. Given the popularity of Padlet at Sussex, Technology Enhanced Learning will secure an institutional licence for the academic year 18/19 which will allow unlimited Padlets, remove advertising, increase upload limits and make adding students easier. In the meantime, this post offers some tips for making the most of your Padlet Basic account. Padlet Basic limits new users to 3 Padlets. If you already had a Padlet account before the change, you will retain your existing number of padlets +3. So if you had 10 padlets before, you now have 13. There are still no limits on the number of Padlets you can post on, or who can post on yours. 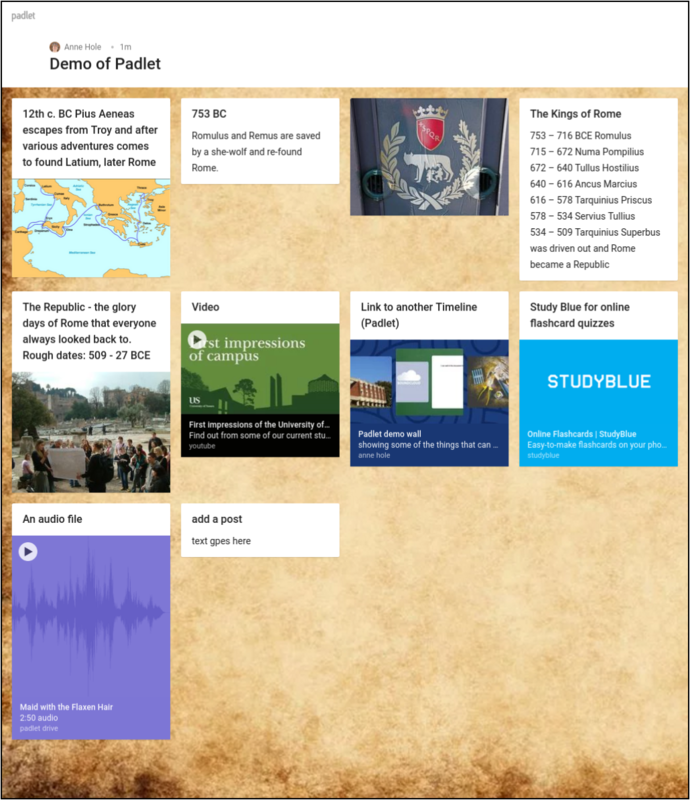 If you have been using Padlet for a while, you may have created quite a few Padlets that are no longer in day-to-day use. You can free up more space in your Basic account by archiving and then deleting these. 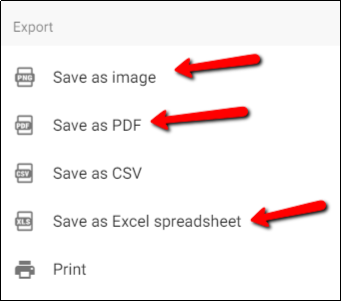 There are several options for exporting Padlets and which you choose will depend on what information you want to save. You can export a Padlet multiple times in different formats so you could choose one or more from this list. This is the most visually appealing option and captures how your Padlet looks, but you lose the interactivity. Links to websites, videos, podcasts etc. are no longer accessible. A PDF does not look as good as an image, but has the advantage of web links being clickable. If students have shared videos, websites and/or podcasts these will still be accessible. Files uploaded to Padlet (rather than links) will not be saved, so you may need to download these separately you want a full archive of the material shared on the Padlet. 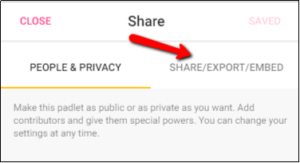 This may not seem like an obvious choice, but if you want to save data on who posted what and when, this will show that most clearly. You can export a Padlet by going to SHARE in the top bar, then selecting SHARE / EXPORT / EMBED. Once your Padlet is safely exported and saved on your computer, you can delete it in your Padlet account via the three dots on the thumbnail in your Dashboard or on the Padlet itself. Which export options are best for me? 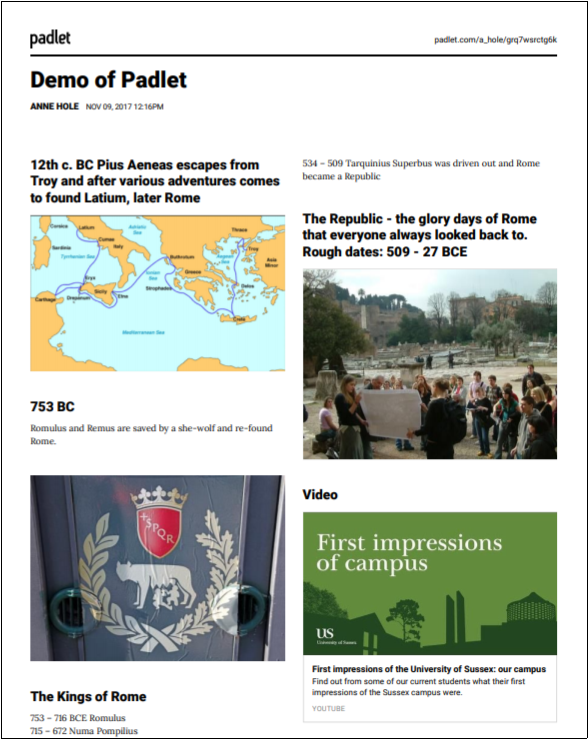 How you archive your Padlets will depend on what you want to keep. The tool is so versatile that it has been used in a wide range of ways. The table below summarises the pros and cons of the main export formats. You can export each Padlet in multiple formats so you should be able to find a combination to suit your needs. Image Captures the visual appearance of your Padlet. Not interactive – links won’t work. Recording how the Padlet looked. PDF Interactive – links to websites, documents etc. still work. Not as visually appealing as an image. Recording links, videos, etc. in a reusable format. Excel Captures lots of data, including URLs of links. Lacks visual aspect. Recording who posted what and when. 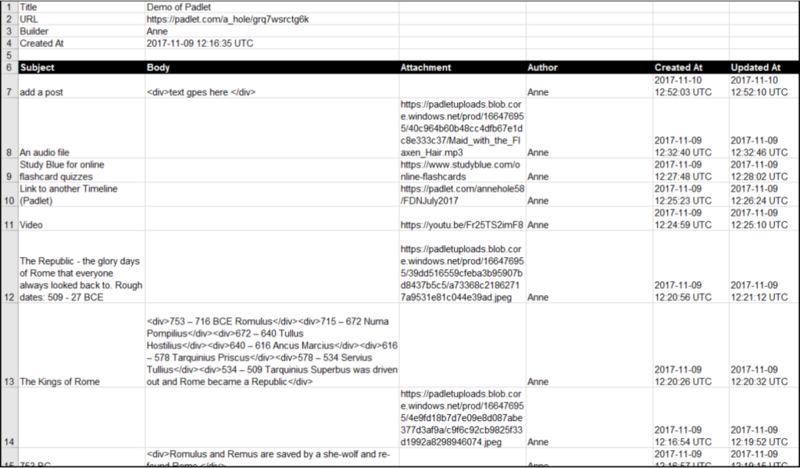 Keeping a list of links. If you would like to know more about how you can use Padlet, or would like to discuss alternatives, please contact tel@sussex.ac.uk. 1 Pings/Trackbacks for "Padlet – some changes to a popular tool"